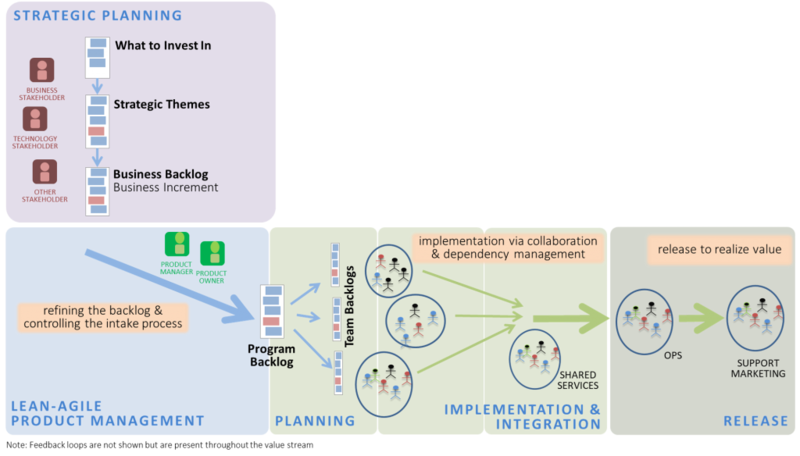 Many medium sized development groups (100-1000 people) are using SAFe’s Program Increment Planning Event as the basis of their Agile approach. This is a good thing since the planning event is one of the best aspects of SAFe and can readily be used with a combination of a few Lean practices to create a lightweight framework. But much more than the planning event is necessary. 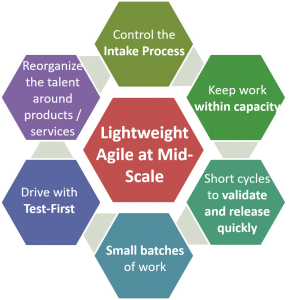 At mid-scale, attending to managing the work to be done can achieve agility much more easily than adding many ceremonies and roles. While the planning event is useful, it must be used towards the bigger goal of achieving business agility – the quick realization of value predictably, sustainably and with high quality. Mid-size companies are often in the dilemma of wanting to use SAFe in a lightweight manner while still needing guidance on portfolio management. This dilemma can be resolved by using an effective Agile Product Management system to guide portfolio management and use the planning event to control the intake process. The solution requires discipline, but not necessarily a lot of ceremonies. Consider figure 1 below and discuss it from a systems-thinking point of view. All of these aspects contribute to the system as a whole and interact with each other. The “intake process” is put on the top because it is a good starting point. By “control the intake process” we mean to ensure that there is a disciplined way of getting work started. Clearly this work must be what provides the most value and for which we have the capacity to build quickly. Overloading teams will slow down realization of value so we must keep work within capacity. Just as important, we must verify that we are working on the most important items. This is best done through the use of small batches of work, such as a minimum viable product (MVP) approach of building just enough to validate the hypothesis that what is being built has the value we think if does. The key to MBIs is to define what value can be delivered and realized as quickly as possible that has the greatest value. This provides us small pieces to work on while creating a focus on the most important increments of value. The idea of an MBI is not to just go small, but to deliver value quickly. In other words, a sequence of small MBIs, each achieving value realization quickly is better than one large chunk of value down the road. In other words, MBIs are not about delivering less but about delivering faster. As a side-note to those using SAFe, this concept would be similar to looking at the smallest solution that could be built and realized. Sequence these MBIs based on cost of delay (a popular approach to use is Weighted Shortest Job First). By looking at the value stream it becomes much easier to do workflow management. Perhaps more importantly, the concept of multiple groups of teams (trains in SAFe) working together must be handled whether you have one portfolio or many. In other words, Lean Portfolio management is important even at mid-scale. By focusing on Agile Product Management we can have both a consistent and simple model to use to manage our workflow. Agile software development provides us with a great method for validating if we are building the right thing. By incrementally creating value, we can get feedback on whether we are building the correct items. The key is to be able to get thin slices to build. This is part of the process of looking at initiatives and creating MBIs from them to deliver. Each MBI is small. But we need to go further and slice off small pieces of the MBI to build and validate. Scrum and eXtreme Programming have demonstrated the value of cross-functional teams. At scale we need teams working together in an effective manner. It is best to do this based on the work that needs to be done. Complete stability of teams is neither achievable nor even desirable. Growing companies will need to start new teams and they will require old hands. But people should be organized as groups around the series of MBIs that come through technology. MBIs provide guidance here because all of the roles related to delivering an MBI will be needed. By using Lean principles to guide us we can identify the most important work to be done and then coordinate it with big room planning. But “big room planning” does not mean we have to plan out quarterly. Ironically the purpose of MVPs in SAFe is to validate the hypothesis of an epic. But if we find the hypothesis to be wrong in the first or second sprint of the program increment, pivoting will require re-planing several sprints. On Running Effective Planning Events we discuss how planning events should be about collaboration and management. The planning is more important than the plan. within the plan, ensure we focus on completing items as quickly as possible in order to manage work in process. If we dynamically track dependencies using a tool such as Net Objectives’ Program Board Builder, we can even do rolling planning. The key here is, of course, Agile product management with discipline. This means clarity on where the organization is going is necessary. It also means that understanding Acceptance Test-Driven Development is critical. Fortunately, by putting less emphasis on a framework and more on the work, budget that would otherwise have to go to framework training can go to team/ATDD training. 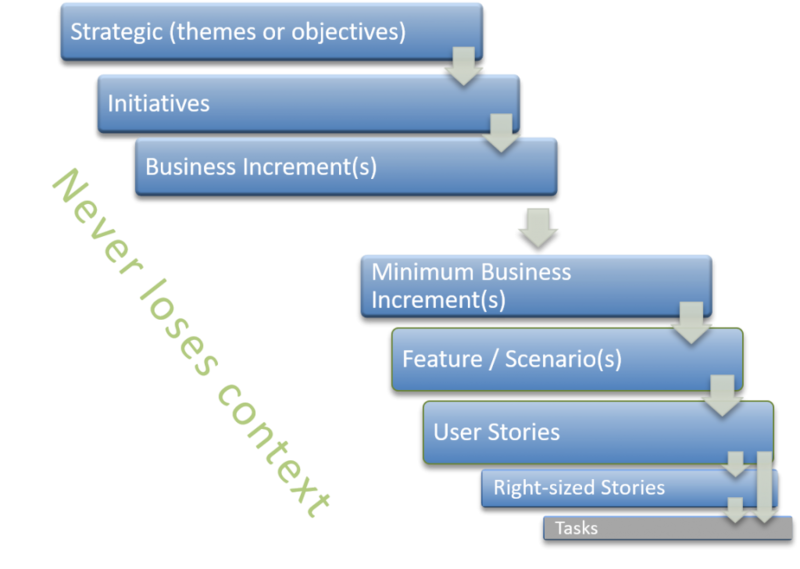 These aspects require an understanding of Agile Product Management and flow but are readily adapted to any organization.